Culti Milano was established at the beginning of 1990, when founder Alessandro Agrati invented the Reed Stick Home Fragrance Diffuser. Upon discovering the intense fragrance gradually released from soaked rattan sticks, Agrati established Culti’s iconic product, soon becoming one of the world’s leading brand for research, quality of products and exclusivity of fragrances. Since then, the brand has expanded creating products from distinctive home fragrances, perfumes and home spa products, even including home and textile accessories. The company prides themselves on their understated design and product yet meticulous attention to the details put in to them. Consistently sourcing the highest quality materials, textiles and ingredients is what makes the brand so sophisticatedly elegant and well sought after. The aesthetically pleasing range and unique styles bring a warmth to personal and working environments, especially apt for the modern day minimalist while diffusing delicate fragrances into the air. 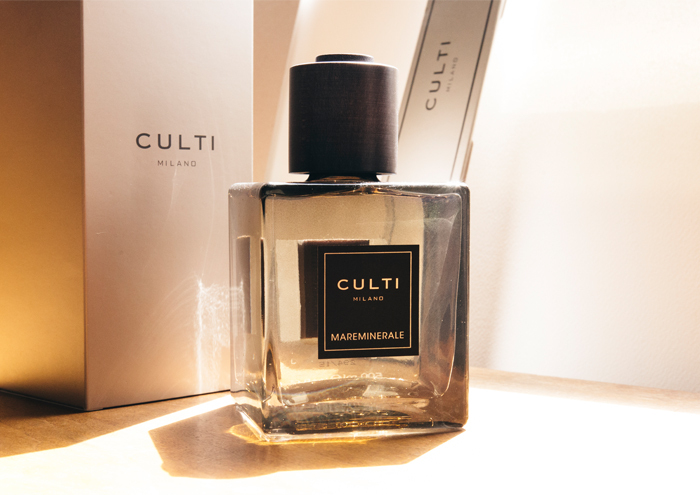 Spring 2016 sees Culti Milano returning to the UK and unveiling its new look and product launching at Harrods and other stockists including Selfridges and Fortnum & Mason. And we promise to keep you updated on all things Culti, so pop back soon.